Here we are looking at fruiting Cherry Trees, including self pollinating cherry tree varieties. They are readily available for sale for the home gardener as well as the commercial grower. They fall into two types, the sweet cherries and the sour cherries. The sour cherries are used for deserts and in cooking. Sweet cherries are the eating variety. The size of the tree differs depending on variety, and also on the root stock that it is grown on. When grown for fruit, they are usually pruned to a size that makes harvesting easier. Pruning can also increase the yield of a cherry tree. And for those with smaller areas, or those who wish to grow cherry trees in pots or containers you can also buy dwarf cherry trees. Most are really a ‘semi dwarf’ that will reach around half the size of a full sized tree, maybe a little bigger. These dwarf cherries are grafted onto a dwarfing rootstock usually ‘colt’. 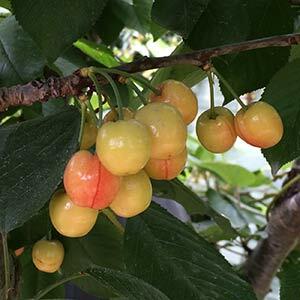 With well over 50 varieties of Cherry trees available, some self pollinating and other requiring a suitable pollinator cherry trees make a great fruit tree for the home orchard. Some varieties fruit earlier than others and flesh colour and characteristics vary. A large, dark red cherry with firm flesh. Used for jam as well as eating. Suits warmer climates. A yellow skinned cherry largish fruit and a nice flavour. Late to ripen. Old early season, heavy cropping variety with large dark coloured fruit. Soft flesh. Excellent for commercial growers good flavour. A self fertile variety with large firm fruit. A late cropping variety. Very dark sweet fruit from this late season cherry. Suits warmer climates and fruits early. Large deep red fruit. Self Fertile. Heavy early cropper. Self fertile, well suited to the home gardener. Good pollinator for many others.